FRAMINGHAM, Mass.--(BUSINESS WIRE)--Jun. 23, 2015-- Parents can get their children 110% ready for school with the newest trends and technology at Staples (NASDAQ: SPLS). The hottest trends range from the latest graphic or camouflage patterns in new colors, to products that provide a life-changing impact or exclusive products that were designed with the help of students. Staples is in stock all-season-long at the lowest prices with the Staples back-to-school 110% Lowest Price Guarantee and up to 5% back in Staples Rewards on every purchase. From homework and lunch to lockers and backpacks, the Staples® Designed by Students Collection includes tools designed by students that help to address common classroom needs. 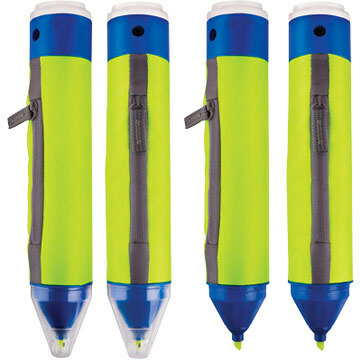 Available in a variety of color combinations, products include The Big Pen ($8.99), a writing instrument and pencil case all-in-one, the Big Props Pencil Case ($7.99) that doubles as a tablet stand and the Super Folder ($12.99) that includes storage areas, a zipper pouch, clear pockets for class schedules, a pencil sharpener, sticky notes and a writing pad, among other products in the collection. This back-to-school season, Staples and Me to We, a social enterprise that provides people with better choices for a better world, are making socially conscious shopping easy with a new line of eco-friendly school supplies. Each product provides a life-changing impact in a developing community where Me to We’s partner, Free the Children, works. The exclusive Me to We Collection includes notebooks, composition books, binders, portfolios, backpacks, pencil pouches, and more that will help make a difference. ($1.99 - $29.99). A full “army” of backpacks and accessories in the coolest camouflage patterns are featured in an assortment of products. The OGIO Evader and Stellar backpacks ($49.99/$44.99) feature a large main compartment, padded laptop sleeve and ergonomic shoulder straps for comfort. These backpacks coordinate with Staples® Camouflage Composition Books ($2.00) and Staples® Maze Calculators ($4.99). Exclusive Teen Vogue products available only at Staples keep students learning in style. Staples® Teen Vogue BETTER Binders ($8.99) add extra fashion and flair in a durable and convenient 1” or 1.5” binder in assorted patterns. Students can show their fashion forward personality while keeping papers together with Staples® Teen Vogue staplers ($4.99) in assorted patterns and stay organized with must-have Staples® Teen Vogue patterned folders ($1.99), Staples® Tech Pop folders ($0.99) and Staples® Tech Pop pattern poly folders ($1.99). With the latest fashion trends on school essentials, students can bring a mixed assortment of fun to the classroom. From trendy animal prints on holographic backgrounds to eye-catching 3D and psychedelic screen-saver designs, Staples carries Continental Into the Wild and Continental Vibrance notebooks and composition books that add fun to jotting notes in class. Tie-dye, inspirational sayings and fun graphics with glasses and mustaches from Gartner Studios ($3.00) let students show off their personal style with notebooks and composition books. Must-have items that will have kids running to the classroom with Boys Licensed juvenile backpacks ($14.99) featuring their favorite characters in assorted prints such as The Avengers and Nickelodeon™ Teenage Mutant Ninja Turtles™. Kids can also choose from a selection of MOJO backpacks ($29.99) with lifelike images of donuts, cheeseburgers, sharks and X-Rays. Or, let Elsa, Anna and Olaf help carry school gear to the classroom with a Disney Frozen backpack ($14.99) and keep lunch fresh in an adorable Disney Frozen square lunch bag ($9.74). Bright and metallic fashion-forward school supplies let students shine. Continental notebooks and composition books ($3.00) add glitter, starlight, diamonds and sassy sayings in combinations of pink, silver, purple and other bold, sparkly hues. Friends will be a-MAZEd by the Staples® Maze calculator ($4.99) that features a maze game on the back and the Glitter and Flow iPhone cases ($12.99) available in an array of sparkly colors that make school days shiny. The Staples® BETTER Binder Scientific calculator ($7.99) makes carrying a calculator to and from the classroom less daunting by fitting right into a binder. The new TI84 Plus CE graphic calculator ($129.99) in a thinner, slimmer design makes crunching numbers stylish, available in black, silver, pink or blue. The new Microsoft Surface 3 ($499) – the tablet that replaces a laptop with power and performance in a lightweight versatile form. For maximum performance and style, find a wide selection of the latest tech tools at Staples. Students can use Staples® Flat Charge & Sync USB Cables ($9.99) with either Flat Micro or Lightning Connectors to charge micro-USB-compatible smartphones, tablets and other devices, or sync them to a computer for quick and easy data transfer. Or, power and charge all portable electronic devices with a Light Pulse Electroluminescent Charge and Sync Cable ($24.99) that radiates ambient lighting. For iPhone 6, 5 and 5s users, Glitter and Flow iPhone Cases ($12.99) are a beautiful and fun option to protect these devices from scratches, dirt and bumps. Get organized while remaining stylish with the Premium File Crates ($3.99) in cobalt blue, rose pink and eco green. For desktop organization, the Staples® Desk Accessories Collections in rustic wire, faux leather and charcoal flax ($6.99-$17.00) will keep essentials fashionably organized. Keep homework, activities and appointments on track with Ampersand by Blue Sky planners and calendars ($19.99 and under) featuring playful designs with plenty of room for important information.